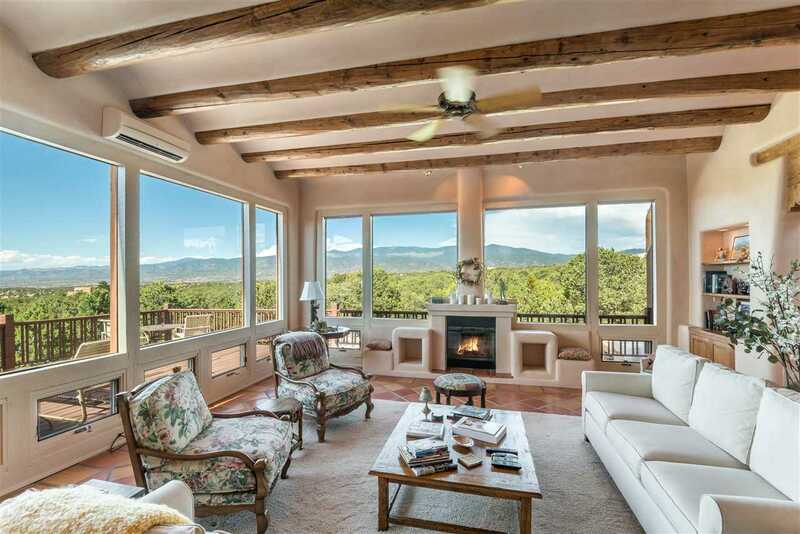 Unparallelled views of the Sangre de Cristo Mountains! Quality Michael Kern design and construction creates a beautifully sited masterpiece. The original home invited fabulous views into gracious living space. Present owners have added an elevator for trouble free garage access. Additionally, Michael Kern added a superb office in 2016 assuring continuity and and attention to detail. Lush entry courtyard set a tranquil tone as you approach the Front door. Drop dead views of the northern badlands greet you. If you can take your eyes off of the vista, the Living room is equally impressive. The Owner&apos;s Suite and the newly constructed office are thoughtfully planned for both privacy and savoring the splendid eastern view. Professional photos added this week. Fully appreciating the hard trowel plaster , custom doors, ceiling treatments, takes time but this elegant home invites you to linger over all of its special features. Total of 3130 sf, Private well, Landscaped, Exquisite Deck, and so much more.